Have you tried Lewis Road Creamery Butter? If you haven’t tried Lewis Road Creamery butter yet, stop what you are doing. Right now. And go get some. And get some good bread. 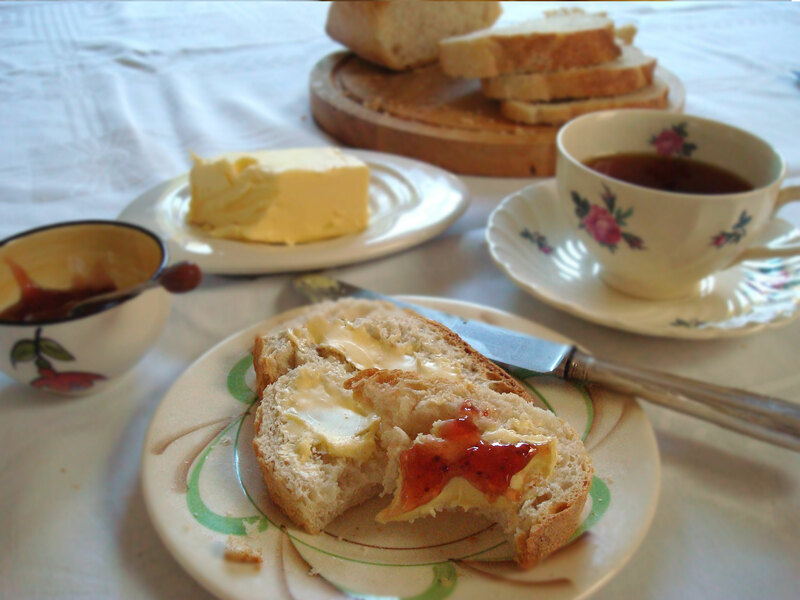 Make a cuppa, cut a slice, slather it in butter, sit back and savour. 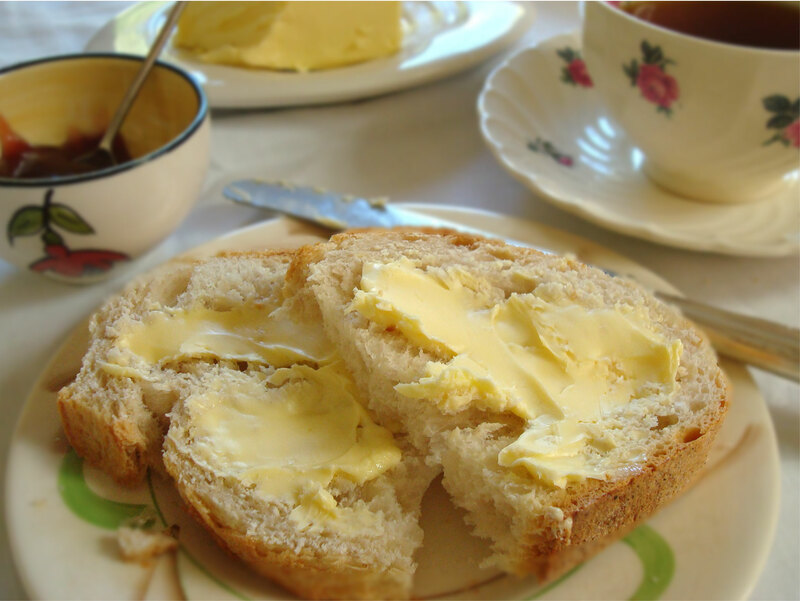 Savour a fine New Zealand butter. I can eat this stuff as is, by itself, sans the bread, it is so good. The taste is fresh and light and creamy with a slight lemon lift at the end. 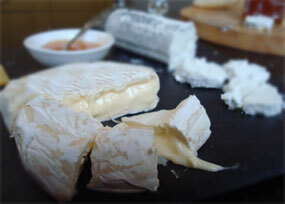 Super fine and velvety, it melts satisfyingly on your tongue, lingering long after factory butter has disappeared. You really feel this is cream made into food. 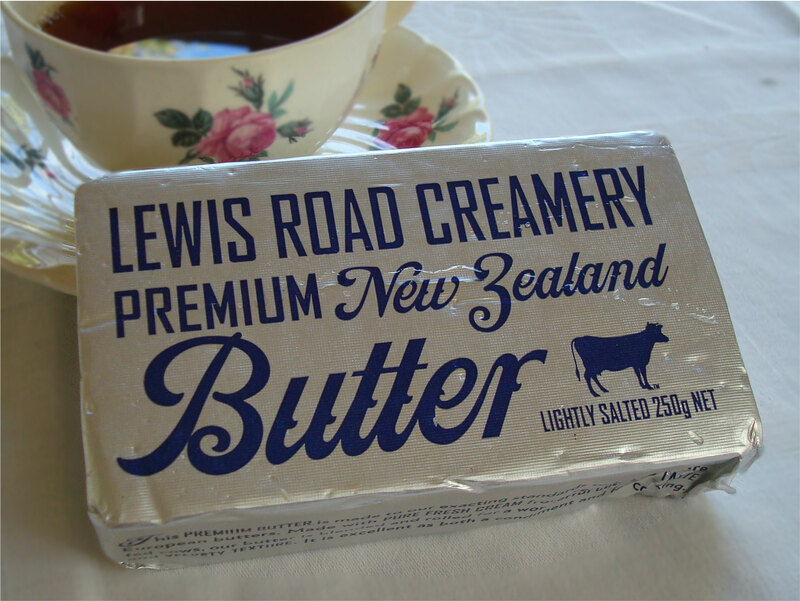 Lewis Road butter is made by Peter Cullinane and Andrew Railton at their creamery in Otakiri in Bay of Plenty. Their mission to create the world’s best butters in New Zealand means they only use milk from Jersey cows. Jersey cows are those pretty brown cows with black feet whose milk is high in butterfat. Most Kiwi cows are black and white Friesians because they produce higher protein. I love this butter in thick slabs on bread. It was great on Bordeaux Batard with Barker’s Strawberry Jam. After a day in the garden it restored both body and soul. It reminded me of the simple days of bread and butter, the days before butter was demonized and replaced by scientists and their margarine and olive oil madness. The dairy geek in me cried yes! My fist in the air in a people’s protest against industrial spreads! I love this butter. I’m with you on this butter. It’s amazing. Like childhood butter, only better. They make an even more exclusive artisan one that I am dead keen to get my hands on. I wonder if I started a petition whether they would sell me some? Is that crazy? Delicious butter! And goodness I would love to try the artisan stuff too…so not not crazy!! I decided to try this butter out, as the name Lewis Road seems to be on every dairy product these days. It was half the size of the average butter block, and at double the price, which intrigued me more. It had to be good, right? Thevery first thing I noticed, was its very unbuttery taste. I mean this stuff smells of margarine. I couldn’t find any package ingredients which hinted at margarine, but I also felt I had been conned somehow, as it is nowhere near as good as actual butter! It’s a con people. I had to donate mine to a margarine eating friend, as I ONLY do butter. Disappointed! Wow, you certainly had a strong reaction. I’ve found it delicious and super buttery. I guess we all taste things differently. I am pretty sure there are struck codes for what can be called butter so I am sure it is pure butter.